Support the local community raising money for a local charity in a fun fundraiser. 1. The pub fund raises as a team for Western Alzheimer’s (we have a list of ideas if you need inspiration! ). 2. The team then decide on a representative who competes against several Galway pubs in the race, which involves running a short distance with a pint on a tray. The person that finishes fastest AND with the most drink left in the glass, wins. 3. 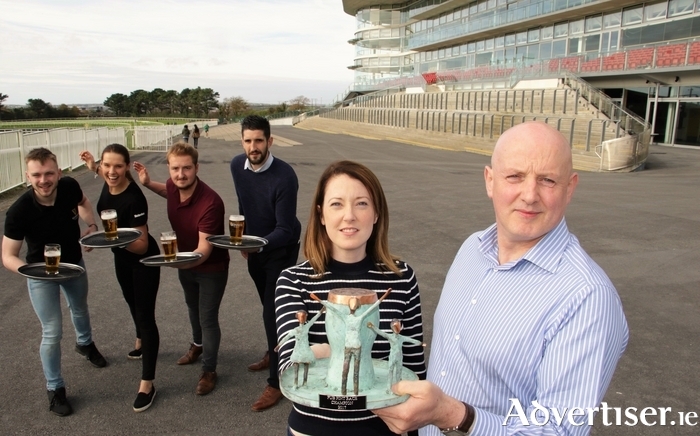 The winning pub receives a specially commissioned sculpture kindly designed and donated by Liam Butler to display in their pub for the duration that they hold the Publican's Pint Race winning title! There are also runner-up prizes and a team prize for most money raised. Thanks to our prize sponsors: The Asylum Rooms Galway, Handsome Burger, Halo nightclub, Roisin Dubh, Chili Shack, The Huntsman, Galway Karting. WHERE & WHEN IS IT ON? It will be the first race on Sunday the 29th of the October Galway Races with a parade ring at 12.15 and the race at 12.30. By supporting this event you can help Western Alzheimer’s continue to provide the following services to carers and families of loved ones living with Dementia and Alzheimer’s disease. · Long Stay Residential· Short Stay Respite· Day Care· In-Home Support· Support Group Meetings· Information & Advice. To get your place in the race call Dee to get on board: 086 3494720.